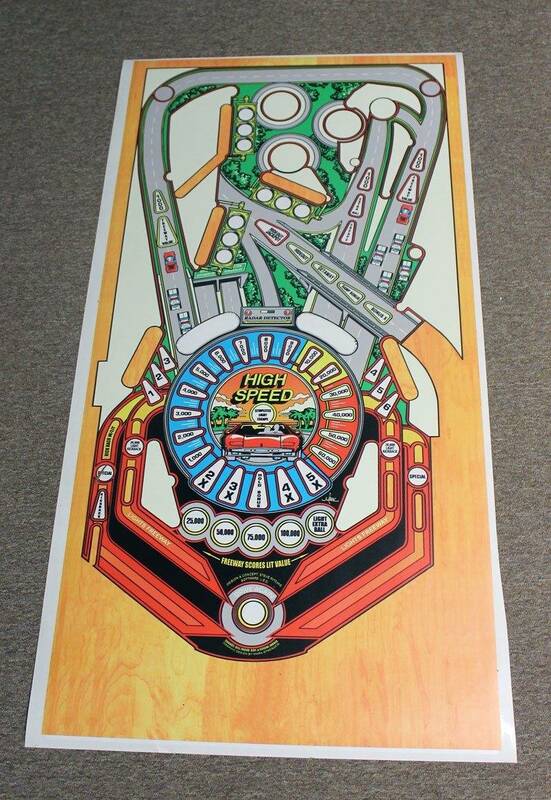 » Forum » All Pinball » Playfield overlay...yes or no? » Playfield overlay...yes or no? 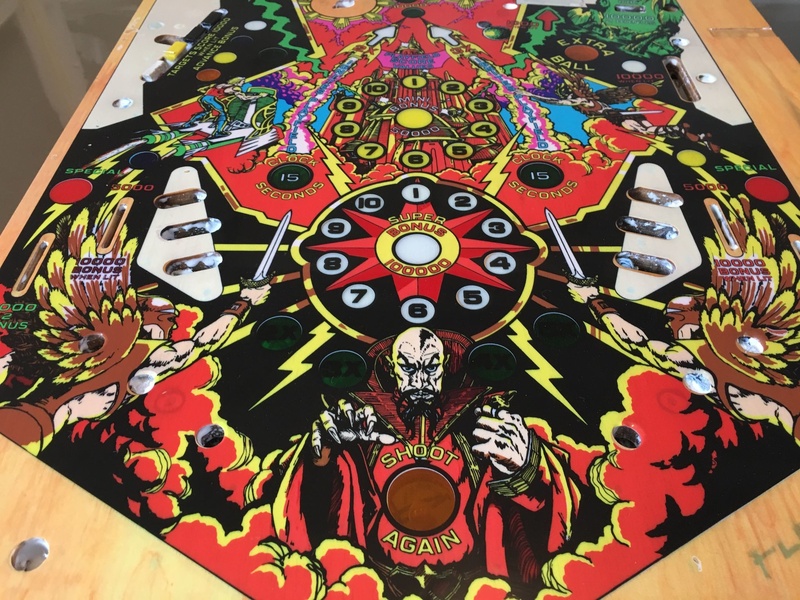 Having trouble finding a decent replacement playfield for a High Speed, I am considering an overlay. I have searched the archives and found a thread or two but looking for some current input on the newer overlays now available. Im not looking for perfection and don't mind doing the labor, just don't want to invest too much into this game like I did when I restored my Pinbot. Anybody have any success or failure with the newer overlays? is there an overlay for it? Is it clear or blurry? the best way to get that to look more natural, is to cut out all the inserts. clear the field. put this on with the inserts cut out. Clear again. use a decal sheet and put the inserts back on using the sheet, and clear everything in until it's level. It will make it look less like an overlay that way. Because printed insert color is horrible. 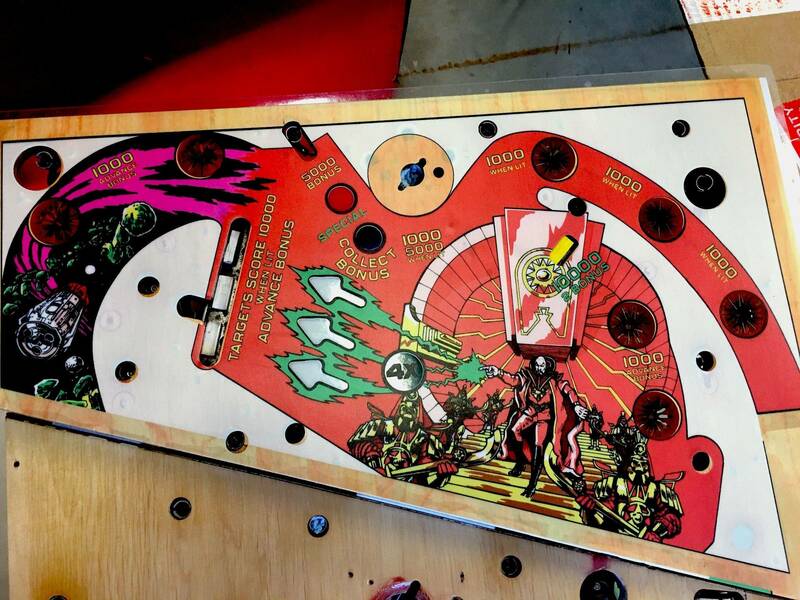 The last overlay I did was on a trashed Gorgar playfield. Actually the entire game was a basket case, and it was an exercise in bringing it back to playable and presentable condition. The overlays back then had the inserts "colored" in the overlay as opposed to the clear inserts now available. Installing the overlay wasn't exceptionally difficult, but trying to line up ALL the cutouts, inserts, etc. was an exercise in patience, and still probably about an 8 out of 10 when done. I've never seen one that was spot on perfect in this regard. So figure you'll be cheating and compromising somewhere when installing. The colored inserts were the biggest complaint as far as cosmetics, along with a loss of detail in the artwork. You lost the "jewel" like appearance with the old overlays. I suspect that the method above would preserve the effect to the best possible result, but seems like a TON of extra work. . Not sure how the clear will show the inserts through.. probably acceptable would be my guess. As far as playability, the results were very good. It was VERY smooth, VERY quiet, and somewhat "soft" feeling... the few mm of vinyl thickness should make this somewhat obvious, but it is a much softer substrate than the ink printed plywood of an original. Lastly, the durability in my experience was very good as well. No issues with waxing, loss or artwork, scratching, peeling, or other adverse affects. I had the game for several years and played it regularly. I had heard of others who clearcoated OVER an overlay and had poor results. I wouldn't suggest trying it due to the thickness and give of the overlay itself. I'd say you're asking for cracked and peeled clear if you do. If you just want a better looking game that plays well, then go for it. Don't spend extra time and effort to make it look better, since it's still going to look unoriginal. Certainly better than peeling paint though! I have one of those. Just can't quite convince myself to put it in. Was thinking lately I might until the CPR's are ready. You could add the missing darker grey coloring from the bottom half of the circles at the bottom of the overlay yourself if you're up to it. Unfortunately, without the highlight/shadow color the center starburst looked really flat in comparison to the original. However, once the overlay was applied, a thin layer of clearcoat was put down and then the missing shadow effect was sprayed on. Due to the complexity of the other areas he only did the center starburst this way, but what a difference! Ed Chueng has an overlay for High Speed on his site. Contact him, and see if it's available. Doesn't someone have that file?! It is far from perfect, but much better than what was there before certainly. - For some reason the top half of almost all the inserts has a slight ring of white between the black outline and the clear insert (misaligned printing?). You can see this if you zoom up the picture in the post above. Filled the gaps with black paint which makes them less noticeable. - The overlay also is not perfectly opaque and shows the original woodgrain through it slightly. You can notice this on the white sections in particular, so you might want to paint the playfield white before applying it, though I'm not sure if that would lighten all the colors or not. All of this is pretty nitpicky stuff though and it is much nicer than the blown out original. 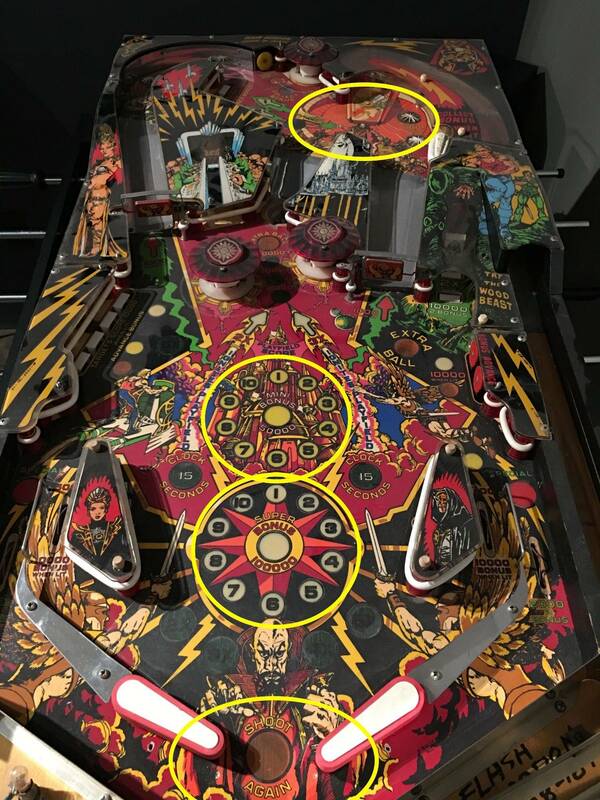 Even CPR playfields can have misaligned outlines and such if the original screens were off (see https://pinside.com/pinball/forum/topic/cpr-centaur-and-fathom-playfields/page/3#post-3346354). One thing I would suggest though is that you consider contacting pinsider cwg29, he created his own Flash Gordon overlay image and it appears to be of much higher quality than the one I have. 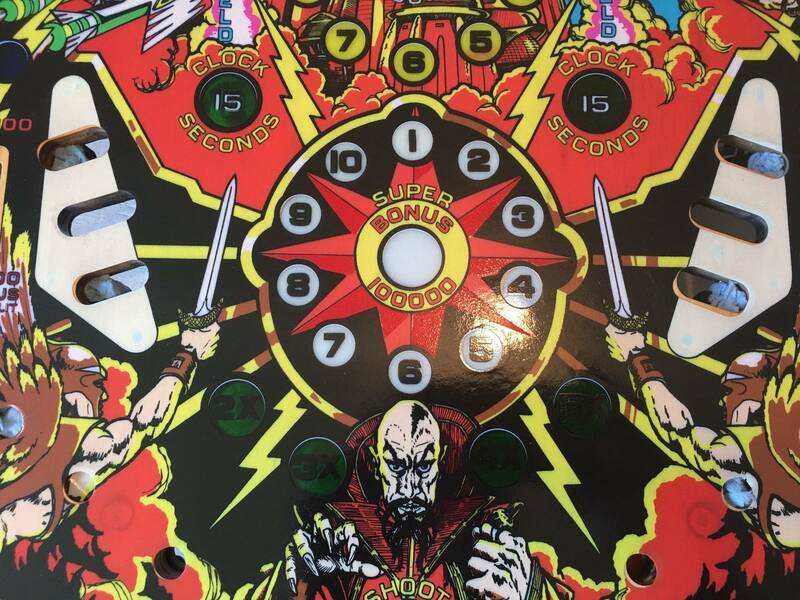 See https://pinside.com/pinball/forum/topic/flash-gordon-overlay#post-2807010. He is willing to share his image, it's a bit more work to get it printed, and you need use the waterslide decals for the inserts with his, but I have no doubt the final product would be nicer. Probably less expensive as well. Thought John Greatwich was also sanding, reprinting & clearing HS playfields, too. I was considering it when I found a CPR. I'll be doing an overlay to my HS at some point as well. I just got it, knowing it was a project. Typical wear on the playfiled and the cab is going to need to be redone as well. Might be time for some custom decals because I really don't feel like stenciling. I asked pretty much the same question about the high speed overlay (they have been on ebay for like 2 years). Didn't get a whole lot of feedback on the topic. 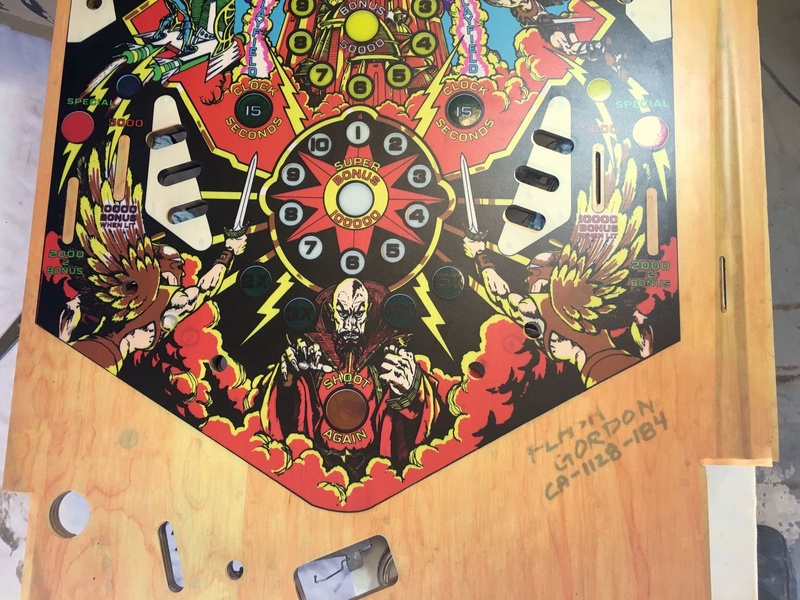 Some of the responders (or posts I found in searches, can't remember) suggest you have to pull out the playfield remove everything including the wiring, lights etc.., sand the original playfield down then install the overlay and clear it. Sounds like a really lot of work. While I don't shy away from labor, might be too labor intensive for me with other more important projects to work on. I was curious as to if you sell the machine, do you get the overlay money back in value. Let's just say I have a $1000 high speed, is it worth $1200 with an overlay? Do people care if a pin has an overlay? I'm not in it to make money, i'm more about losing the least as possible these days. do you get the overlay money back in value. Depends on how well it's done. The value of a restored game depends who is willing to spend the money. There is a limit to what value people will pay too. For example: if a nice original game is worth $1000, it doesn't make sense to put in a $700 CPR playfield and $200 plastic set and $100 worth of LED's, and $200 to restore the cabinet; plus all the cleaning and fixing boards and mechs. The base game you started with would have to be free if you wanted to be close to the market value when done. This is why an overlay is a good option. If a game is properly prepared in regards to FULL sanding, it is a good alternative if NOS or reproduction playfields are unavailable. If this step is skipped (or partially sanded) you will not be a happy camper in the end. This is not the same as some cabinet artwork for example, that some can "cheat" and hide the short stepping (including painting the cabinet black OVER the original artwork). Many times the inserts need to be "reset" for proper leveling, and need reglued, or outright replaced. 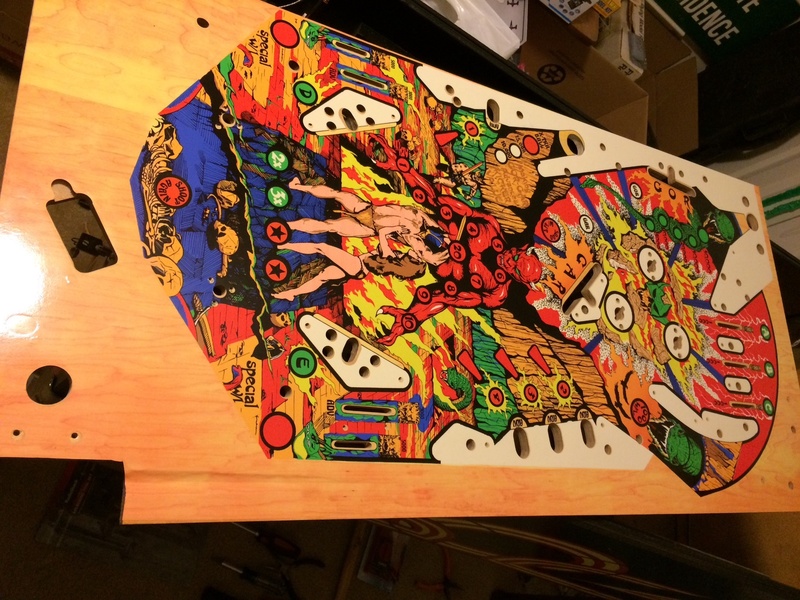 Overall the process will take roughly half the time of doing a full playfield swap if an owner is experienced. Some do use clear coating afterwards, but make sure the overlay adhesive is really solid, or you waste a lot of time and money down the road if it lifts just like D1M. Scrutinize the overlay image of the manufacturer to look for printing "blurriness", as they is a sign that the production ink either bled, used an improper transfer process, or cheap materials. Are the overlays marked for location of posts, ramps, ball guides etc? marked for location of posts, ramps, ball guides etc? Best thing to do here is to take lots of pics of the original. Then, once the overlay is on, take a soldering iron to the holes. For larger holes, use a razor blade to cut away the excess vinyl. Cut away all fake wood of the overlay before applying. This helps with alignment as well as lets the natural wood show through. Note: when sanding, I like to leave the game name an number under the apron intact. Overlays don't usually have this printed. If it is, it would be on the fake wood print. Really? I have not done an overlay in probably a dozen years. But when I did a Space Invaders ($150) back then the large stuff was already cut (Pops, slings. . . ) and where the post holes were located a small circle was printed. So you could get a feel for the spot and punch, cut burn or screw a hole. A dot for a guide wire. I just got a Taxi that has all the large cut outs already cut. No screw locations are marked. I got some thin transparent paper and marked all the screw holes with a small nail. Once I clear the bare wood and install the overlay then I can remark the playfield with the original hole locations. I plan on using a fine tip sharpie then i'll be ready to clear overlay. Good luck, this may be you only option. 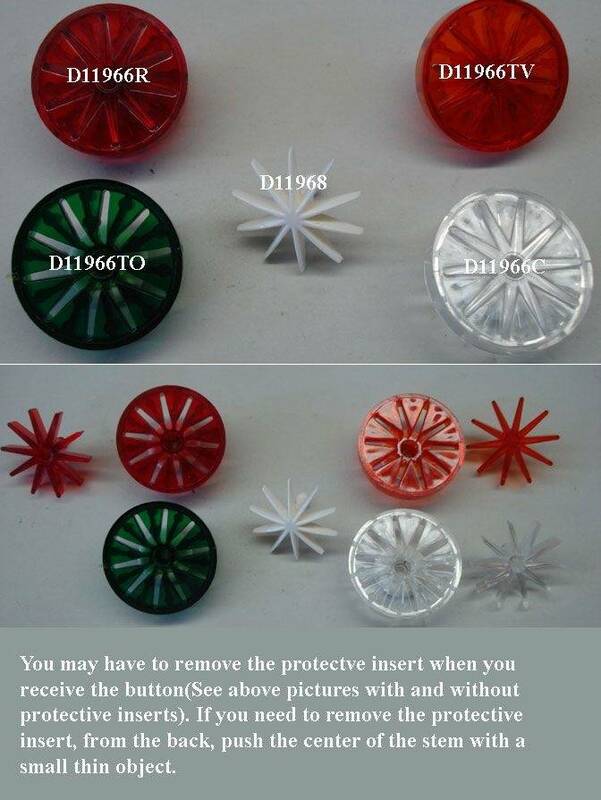 When clearcoating over the overlay, what do you do with the round insert with white star inserts? Do you install the new ones then clear over them? Once complete I would assume them you insert the white star? 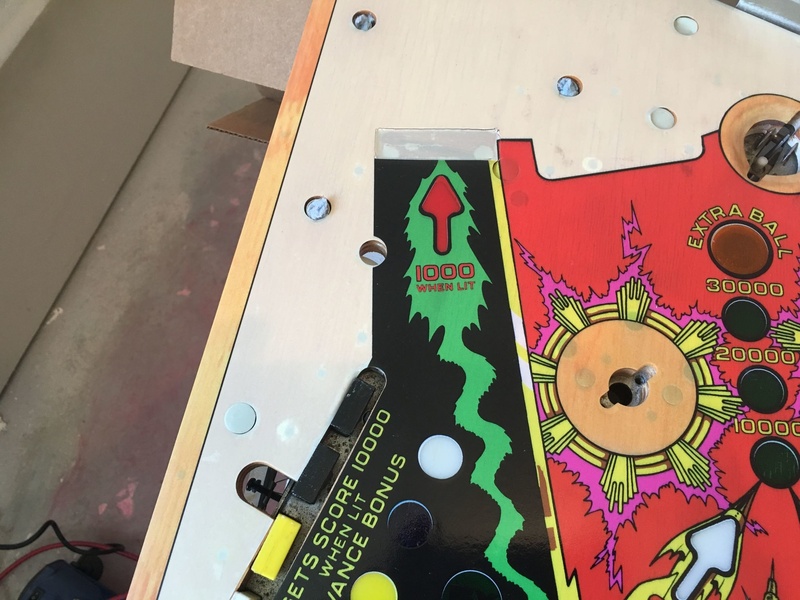 If so, do you leave the colored insert slightly higher than the playfield to accommodate the thickness of the clearcoat? 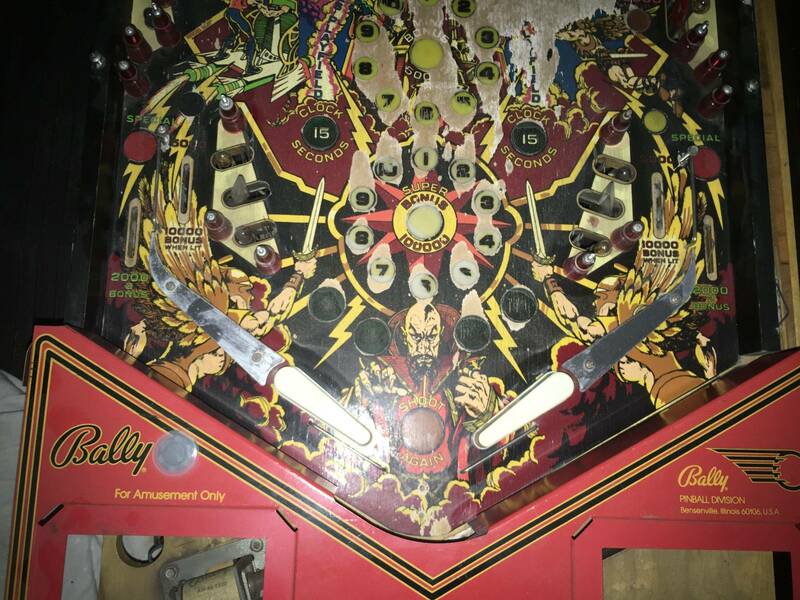 Vid's playfield restoration thread shows to put old inserts in upside down, clear, remove, put new ones in the proper way.